We are proud to announce that Woodbury Lafayette Community Association has selected Tinnelly Law Group as their association’s legal counsel. Woodbury Lafayette is a brand new condominium community by The New Home Company and is centrally located just a short five minute walk from downtown Lafayette. It consists of luxury Garden Flats and Terrace Flats, many with views of Mount Diablo. 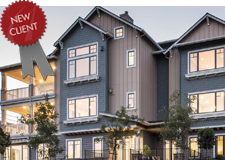 Woodbury was recently honored with the “Community of the Year” award at the Bay Area Building Industry Association’s (BIA) 2016 Excellence in Home Building Awards. Our HOA attorneys and staff look forward to working with Woodbury Lafayette’s Board and management.